Taylor Wimpey £130m Leasehold Ground Rent Review For "Housebuilders' PPI"
“In terms of timing, we don’t expect this to result in a significant near sort of immediate cash payment from the group. We think it will be spread over a number of years. Did they really Mr Redfern? Many were forced, coerced, or otherwise financially incentivised to use housebuilders’ recommended solicitors, never a good idea and can hardly be described as “independent legal advice.” In fact a class action for negligence is being prepared against new homebuyers’ solicitors. It is clear to me from the transcript of this broker teleconference, that Peter Redfern has no intention of ever helping those that bought leasehold new houses to obtain their freehold, either at reasonable rates, or at no cost as part of a compensation measure. Indeed, it is clear Taylor Wimpey do not even believe they have done anything wrong selling new houses on a leasehold basis. It is to be hoped that those in government are not taken in by this token gesture (‘Ground Rent Review Assistance Scheme’) which only relates to ground rent doubling every 10 years and nothing else. Even that, Redfern predicts, will take a “number of years” to complete. It is my opinion that Taylor Wimpey have broken ranks, in an attempt to claim a non-existent moral high ground over other miscreant house builders. Peter Redfern, no doubt in consultation with other housebuilder CEOs, who unlike Taylor Wimpey, have no plans to stop selling their new houses on a leasehold basis, made this move to give the impression the industry was contrite and doing something positive. 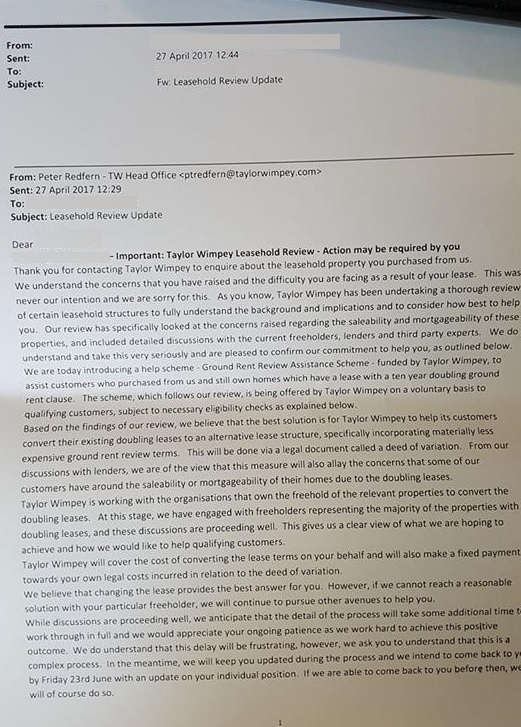 Indeed the Leasehold Knowledge Partnership said on their website that Sir Peter Bottomley and Jim Fitzpatrick MPs and co-Chairs of the APPG for Leasehold and Commonhold Reform, “were contacted by Taylor Wimpey last night [26 April]. They were invited to discuss the issue with CEO Peter Redfern at 10am” [27 April] following the announcement and ahead of the firm’s AGM an hour later. This statement has the potential to pull the wool over the eyes of those in parliament who quite rightly, want the sale of new houses on leasehold banned and those leaseholders for whom it is too late, given an opportunity to buy their freeholds either at reasonable prices, or be given their freeholds by their housebuilders. Obviously the housebuilding industry does not want this. It will be very expensive, albeit still affordable, given the excessive profits being made and obscene levels of LTIP bonuses being handed to CEOs – most of which has only been achievable because of the Help to Buy Scheme. 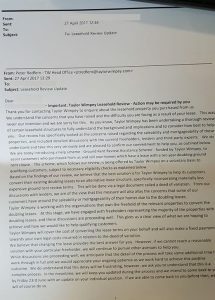 The Taylor Wimpey statement has enabled the industry an opportunity shed some positive, pre-emptive light, on what has been and continues to be, nothing short of a national scandal, described in parliament as the “PPI of the housebuilding industry” that has been allowed (and currently perfectly legal – but not morally right) for many years. An industry-wide hoodwinking of new homebuyers, many buying with the taxpayer-funded help to buy scheme, now own virtually worthless leasehold houses. There is not a single reason why legislation cannot be brought very soon after the election, to ban the sale of leasehold new houses. Perhaps each party should make this pledge in their manifestos. It is time and it is right that Help to Buy is withdrawn. This entry was posted in New Homes, Taylor Wimpey and tagged ground rent, leasehold, pete redfern, taylor wimpey. Bookmark the permalink.